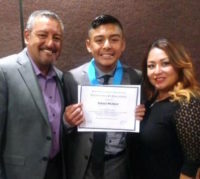 Diego Munoz and Tonantzin Torres-Munoz were honored at the Salesian High School and Sacred Heart High School Academic Excellence Dinner with $1,000 scholarships each –– to Salesian High School for Diego and to Sacred Heart High School for Tonantzin, if they choose to attend those Catholic high schools.The two Santa Teresita 7th graders were chosen for academic achievement, extracurricular activities and community involvement. Diego and Tonantzin were recommended by their teacher, Mrs. Inez Rodriguez, for this prestigious award. Both students are highly motivated and always bring their best to whatever task is placed before them. They are always willing to offer assistance whenever and wherever it is needed. Their commitment to being examples for academic achievement and school/community involvement for younger students is exemplary. Diego, along with maintaining top grades, was Secretary of Student Council and will serve as Class Representative for the 2018-2019 school year. He is a member of YOLA, Youth Orchestra of Los Angeles, which practices four days a week, and is an avid baseball player with City Terrace Lookouts of Los Angeles. Tonantzin maintained high academic achievement, was Treasurer of Student Council, and will be Student Body President for the 2018-2019 school year. 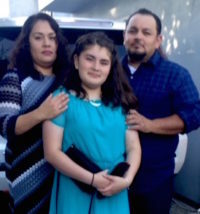 Tonantzin is also involved in cheerleading and softball with the local park district. Belief in God and the teachings of Jesus Christ are the cornerstones of the Santa Teresita School community. We believe that all of God’s children deserve a quality education in a safe and nurturing environment. We work together with parents for the Christian and academic education of their children. As a community of dedicated administrators, teachers, parents and students, Santa Teresita School strives to develop faith-filled, responsible citizens for our global community by providing a quality education which emphasizes academic progress, self-discipline and moral training.